Fulbright Visiting Scholar, Swartz Center for Computational Neuroscience, University of California, San Diego, Aug. 2013-Jul. 2014. Assistant Professor, Department of Computer Science, National Chiao Tung University, Feb. 2003-Jul. 2010. Postdoc, Integrated Brain Research Laboratory, Taipei Veterans General Hospital, Mar. 2002-Jan. 2003. 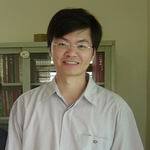 Adjunct Instructor, Department of Economics, National Taiwan University, Sep. 2001-Jan. 2003. Postdoc, Laboratory of Intelligent Systems, Institute of Information Science, Academia Sinica, Jun. 2001-Feb. 2002. Ph.D., Department of Computer Science and Information Engineering, National Taiwan University, Sep. 1996-Jun. 2001. Research Assistant, Institute of Information Science, Academia Sinica, Oct. 1995-Jun. 2001. M.S., Department of Computer Science and Information Engineering, National Taiwan University, Sep. 1993-Jun. 1995. B.S., Department of Computer and Information Science, National Chiao Tung University, Sep. 1989-Jun. 1993.